We all strive for the best quality materials while building our homes, but little do we knowÂ about how to choose the good quality materials. The quality determinant factor for theÂ elementary building materials like the steel TMT bar precisely depends upon its qualityÂ gradation. Such quality gradations are primarily divided in three categories: Fe 415, Fe 500Â and Fe 500D. Concrete mixture is considered to be the best binding compound for construction; howeverÂ its ability to withstand higher tensile load is quite low, thus it needs to be reinforcedÂ through steel TMT bars to make it a corrosion resistant structure. Thus, a good quality TMTÂ bar plays an elementary role in making the RCC structure stronger and more stable toÂ endure external loads and hazards. It first started with plain steel bars, evolved through deformed pained rebar to cold twistedÂ steel bar. Presently the market is dominated by steel TMT bars that are manufactured withÂ first class iron ore and processed through thermo-mechanical treatment, using tungstenÂ carbide rollers. Generally people tend to opt for TMT bars with higher specified grade;Â however one must remember that each construction type has its own requirements toÂ fortify the structure with great strength and ductility. Modern construction experts give greater emphasis on the safety of an RCC structure, whichÂ is dependant the ductile strength of the structure, more specifically upon the reinforcementÂ steel rebar. Thus they use modern limit state method for detailing. Generally the types ofÂ loads taken into consideration are the live load, dead load, wind load and earthquake loadÂ etc. and their combinations. Both material strength and acting load are given thoroughÂ attention while designing any RCC structure. Thus they tend to use Fe 500 grade which in turn ensures ductile strength and reduces theÂ steel volume and column size as well. Whereas Fe 415 steel rebar requires greater numberÂ of TMT bars to endow with the required strength, consequently increase the number andÂ size of columns. This becomes a serious issue where space is an elementary concern,Â especially in case of high rises. The quality grade of steel for both Fe500 and 500D is same; it is 500N/mm2. 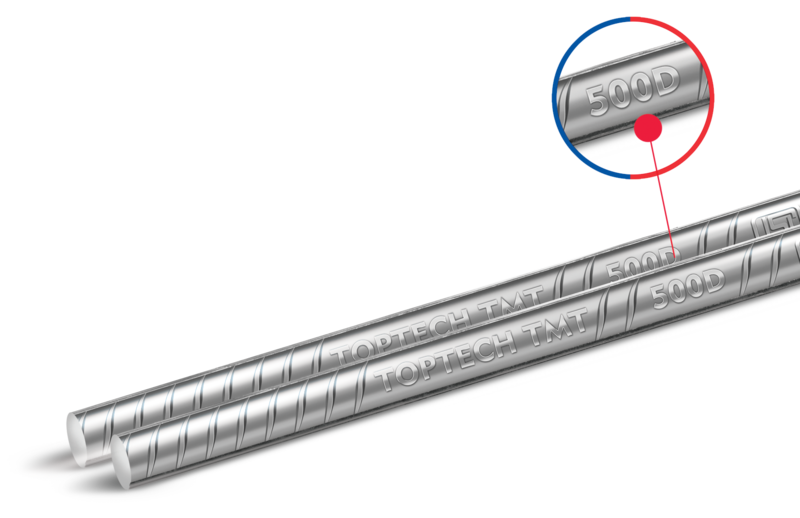 However theÂ difference lies in the higher ductile strength in 500D grade TMT bars. â€˜500â€™ here refers to the Â consistency in strength and â€˜Dâ€™ denotes the ductility of steel rebar. This enables the TMTÂ bars to hold up to the unexpected load absorption ability, which is mostly encounteredÂ during earthquakes and other calamities. Another point to be noted that good quality 500 D rebar is at par with the latest standardsÂ set by Bureau of Indian Standards (BIS). TMT bars presently used in India are mainly Fe 500D grade. They are well surpassed theÂ minimum limit of strength and ductility specified in the standard IS : 1786, ensuring theÂ quality of steel TMT bars. You may always ask for ‘Test Certificate’ of your ‘Rebar Purchase’ and compare the data given in this content, to choose which particular grade of TMT bars is suitable for your Dream Home.